James Martin's oven-baked take on a toasted sandwich combines homemade sourdough bread with a Mediterranean filling. For this recipe, you will need a freestanding mixer with a dough hook. For the bread sponge, in a bowl, mix together the flours, yeast and sugar until well combined. Whisk in the water to form a thick batter, then cover and set aside to ferment for 1½ hours. For the bread, when the bread sponge has fermented, scrape the bread sponge into a freestanding mixer fitted with a dough hook. Add the flour, semolina flour and salt, then start the machine running (cover the bowl if possible). Pour in 300ml/10½fl oz of the water, adding the remaining water little by little once the mixture has come together as a soft dough. Turn out the bread dough onto a lightly floured work surface and knead for a few minutes until smooth and elastic, then return the dough to the bowl, cover loosely with a greased piece of cling film and set aside to prove for 1½ hours. Knock back the dough by punching the air out of it several times, then divide the dough in half. Knead each half lightly then roll both into a baguette shape with pointed ends. Transfer the baguettes to a baking tray and make several slashes into the top of each using a sharp knife. Set the baguettes aside to prove again for 1 hour. When the baguettes have proved, preheat the oven to 220C/200C Fan/Gas 7. Bake the bread in the oven for 45 minutes, then set aside to cool before slicing. For the hot tinned sandwich, reduce the oven temperature to 200C/180C Fan/Gas 6. Line a 1kg/2lb 4oz loaf tin with greased aluminium foil (the greased side should face upwards). Blend three-quarters of the rocket, half the basil, and all of the garlic, parmesan and olive oil to a smooth but grainy consistency in a food processor, or pound it using a pestle and mortar. Add the pine nuts and season, to taste, with freshly ground black pepper, then blend or pound the pesto again until well combined. 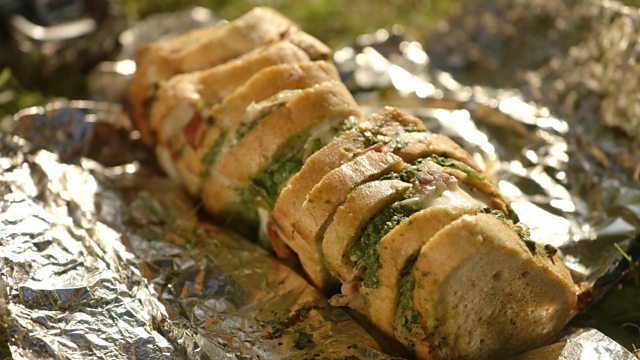 Spread two slices of baguette with pesto, then fill this sandwich with a layer of rocket leaves, basil leaves, mozzarella, and serrano ham. Repeat the process with the remaining bread and fillings. Pack the sandwiches tightly into the prepared loaf tin, then fold the foil over the top so that the sandwiches are completely enclosed in the foil. Cook the sandwiches in the oven for 25-30 minutes, or until the cheese has melted and the sandwiches are completely heated through. Unwrap the sandwiches and serve immediately. You can also make this recipe on the barbecue. Allow the flames to flare up and die down and the coals to start glowing before you start to cook on it, then place the sandwich-filled loaf tin onto the coals.